There are very few vehicle systems or parts as important as your brake system. The brake system gives you a desirable driving experience by providing a smooth brake when you need to slow down or stop. If you’ve ever had a brake system problem, you already know that bad brake pads, warped rotors, or contaminated brake fluid can give you shimmies and shakes in the cabin when you stop your vehicle. Beyond the driving experience concerns from a brake system problem, your brake system is a vital safety system. If you can’t stop your vehicle at peak performance, then your safety is at risk when you need to stop to prevent a collision. In short, one of the best ways to promote a good driving experience with maximum safety is with a routine Nissan Complete Front Brake Service. If you are experiencing any of the signs of a brake system problem, schedule brake service today and we’ll fix the problem quickly and conveniently. At United Nissan, we are interested in extending maximum vehicle maintenance efficiency to our customers. That means providing our customers with proactive service that reduces long-term maintenance costs at the perfect time. Since front brake pads generally wear out twice as fast as rear brake pads, it just makes sense to maintain your vehicle in the same way. Nissan Complete Front Brake Service focuses on your front brake pads, brake fluid, and inspection because your front brakes handle most stopping force and wear out faster. Another tremendous benefit of front brake service is that it gives you the opportunity to inspect your brake system including the calipers, fluid, and tires for tread depth and wear. At the heart of Nissan, Complete Front Brake services are your Brake Pads and Brake Fluid. Since your brake pads and fluid will wear out faster than any other component, they will need to be changed routinely if you want maximum stopping power and safety. 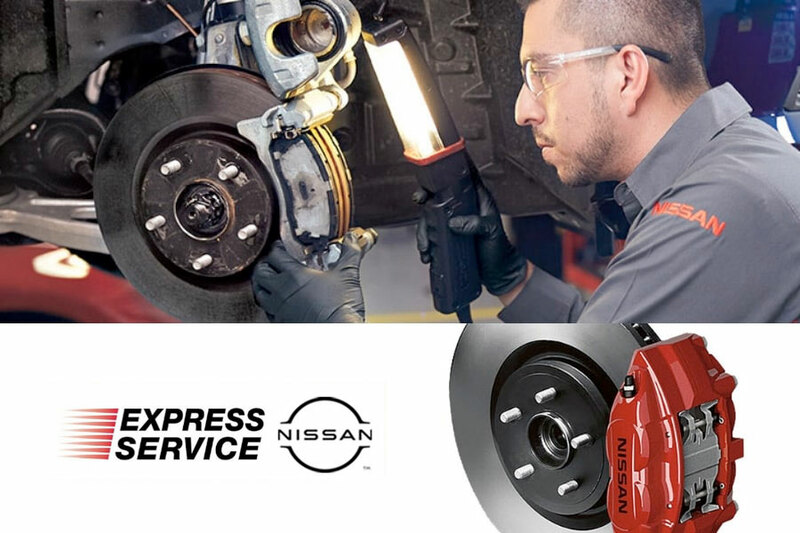 Every Nissan Complete Front Brake Service will remove your worn out brake pads and brake fluid and replace them as needed with genuine Nissan approved brake pads and fluid that have been rigorously tested for fit and performance in your exact vehicle.